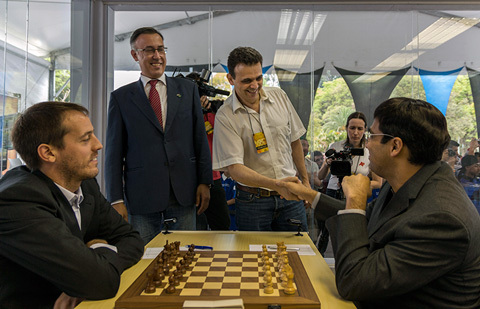 9/25/2012 – The São Paulo stage of the Grand Slam Masters just started, with a dream lineup: Carlsen, Aronian, Anand, Karjakin, Caruana, and Vallejo-Pons. 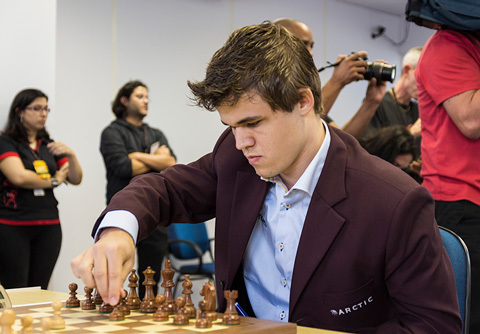 The very first round saw drama strike after Aronian swiftly beat Karjakin with old preparation he had stored, while Carlsen tried his utmost to beat Caruana, and just as he could, blundered and lost. Large illustrated report by Albert Silver. 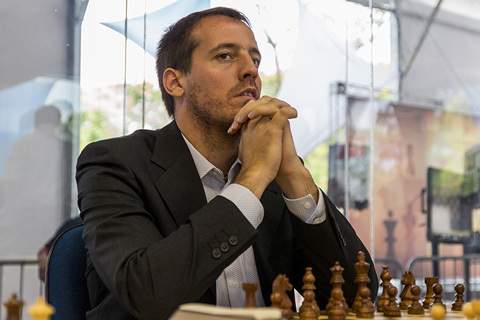 Though the last few days have seen the chess world’s attention turned towards the London Grand Prix, today the Grand Slam Masters started with the cream of the crop: world number one Magnus Carlsen, world number two Levon Aronian, the world champion Vishy Anand, the youngest grandmaster in history, Sergey Karjakin, the rising phenomenon Fabiano Caruana, and top Spaniard Francisco Vallejo-Pons. In this ten round double round-robin there are no boards with less than stellar appeal. To further ensure maximum efforts to win, the tournament uses the football scoring method of three points for a win, and only one for a draw, to which the Sofia rules are added, meaning draws cannot be offered without the arbiter’s permission. 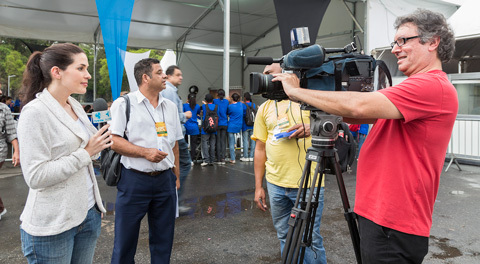 from TV Brasil, a public television network. 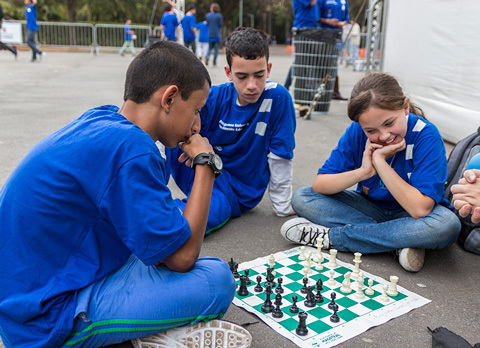 Following its tradition, the games are played in the glass cube referred by the players as the “aquarium”, allowing it to be played outdoors, but still quiet enough for the games not to be hindered by an excited audience. In fact, the live commentator area is right next to the cube itself! 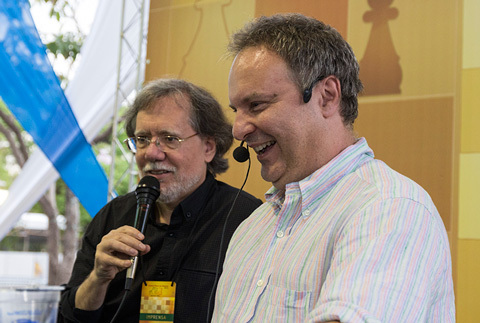 Leontxo Garcia was unable to make the trip this time due to prior commitments, but will be replaced by Susan Polgar, who will analyze alongside the polyglot GM Gilberto Milos. As she will only arrive tomorrow, GM Ian Rogers was kind enough to join Milos to provide dynamic feedback and analysis. 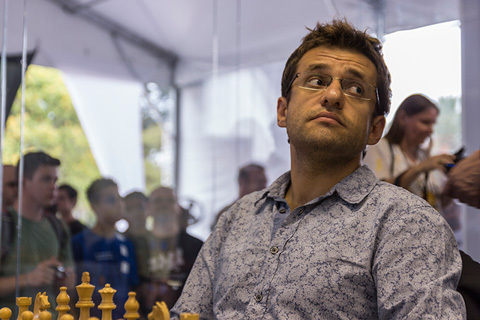 The first game of the day was decided by Levon Aronian quickly steamrolling Sergey Karjakin, when the young Russian entered a line the Armenian said he had been waiting a longtime to meet with detailed preparation. The wait was worth it as he notched a powerful win and opened his tally with three points. ...world champion Viswanathan Anand to a draw. After this, some time passed before the next game ended. 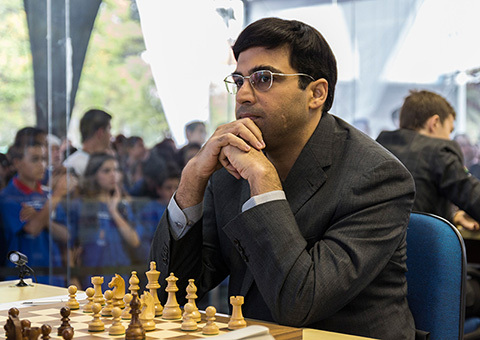 Vishy Anand and Francisco Vallejo-Pons played a protracted struggle in which the advantage actually swung both ways. Ultimately neither player got more than a nagging edge and it pettered out into a draw. The last game was also by far the most dramatic. 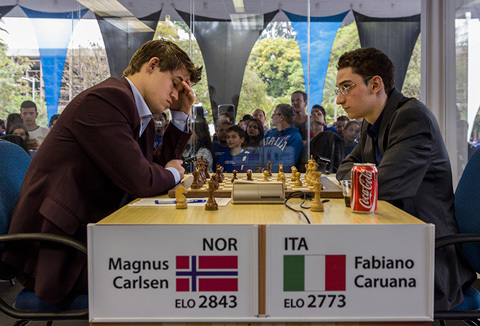 Fabiano Caruana found himself facing a French defense by Magnus Carlsen, and seemed to get a significant edge very early on. This did not last long as the game then swung the other way and he was on the defensive for the next fifty moves. 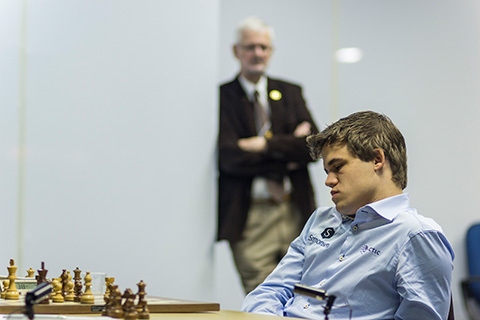 Magnus appeared to have several chances to decide the game in his favor, but somehow it never turned out that way, and instead the game also seemed destined to end in a draw. 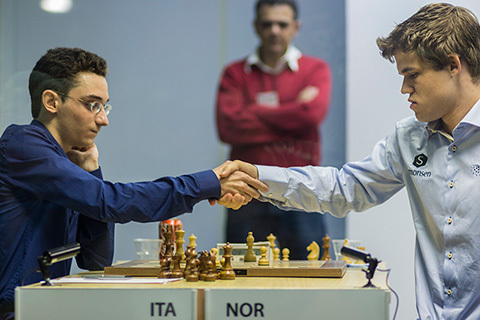 Everyone, from the grandmaster commentators to the spectators just waited for the players to shake hands, but Carlsen was having none of it. He wanted to play for a win! Though this can often be a recipe for disaster, he seemed to understand the fine balance between playing for the win, and forcing into a loss. Miraculously he got his wish as he steered the game to a genuine win, but at the cost of his precious time on the clock, and a few moves short of the time control, he not only missed the winning continuation, but tragically blundered into a loss, and suddenly it was all over. In the post-mortem, Caruana was still shocked by the turn of events and was a little more subdued than usual, but one suspects he will soon be jumping in glee once the enormity of his good fortune registers.